MICHAEL CONLAN believes Irish professional boxing is the strongest it has ever been and warned the world: The best is yet to come. 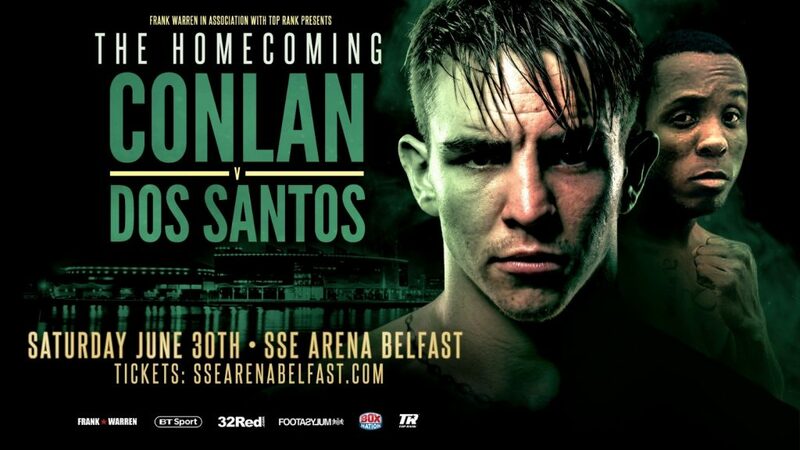 Conlan returns home to Belfast on Saturday when he meets Brazil’s former world title challenger Adeilson Dos Santos at the SSE Arena (Live on BT Sport) in a non-title ten rounder. Conlan who hasn’t boxed in his home city since February 2011 added: “I think Irish professional boxing is the strongest it has ever been. Besides Conlan’s march to the top, two-time world champion Carl Frampton is in the form of his life and close friend Paddy Barnes challenges for the WBC ﬂyweight title at Windsor Park in August. Besides those success stories Ryan Burnett holds a WBA version of the world bantamweight title. Conlan, 26, who has won all seven ﬁghts since turning professional in the United States insists he will be home to ﬁght once a year despite being a boxing darling in New York. And he is dreaming of a triple world title bill boxing alongside Frampton and Barnes. “It would be unbelievable if Carl, Paddy and myself could all defend world titles on the same bill. The undercard has produced one of the most competitive undercards ever seen in Belfast with a catalogue of 50-50 needle showdowns. World ranked Jack Catterall risks his WBO super-lightweight title against Belfast’s Tyrone McKenna. Derry’s Tyrone McCullagh meets Glasgow’s Joe Ham in vacant Celtic super-bantamweight title clash that doubles as a British championship eliminator. Jack Catterall has dismissed the notion Tyrone McKenna presents the most thorough examination of his world title credentials. The unbeaten super-lightweights are preparing to collide in a mouth-watering clash on the undercard of Michael Conlan’s homecoming on June 30 – with many viewing the bout as impossible to predict. World-ranked Catterall (21-0-KO12), however, is supremely confident of retaining his WBO strap against ‘The Mighty Celt’ (16-0-1-KO6). Catterall said: “Tyrone is not my toughest test to date. I’ve been in tougher fights than this one will be. “Nathan Brough was a tough amateur and I knocked him out. Tyrone Nurse achieved more than McKenna. Nurse had some good wins and lots of momentum before I fought him. “I’ve also sparred McKenna myself. I sparred him before my British title fight once or twice. He’s a southpaw and very tall but the way he fights is fine for me. “The way Tyrone fights, it looks like he’s not shy in coming forward to have a go and that suits me down to the ground. He’s there to be taken out. “I believe there’s only one winner but I do respect him. I was actually talking to him a couple of weeks before the fight got announced. I hope Belfast gets behind him – they seem to love him. Michael Conlan headlines in his homecoming show on June 30th at the SSE Arena, Belfast. 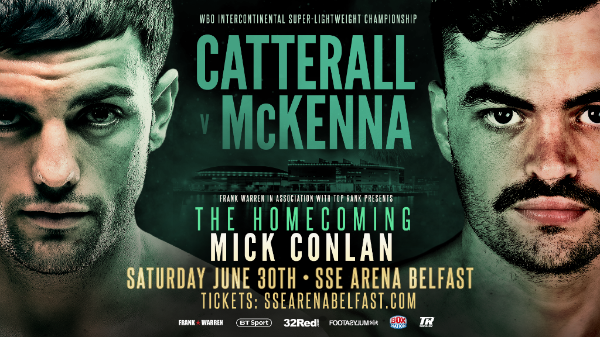 Catterall v McKenna is just one of a host of huge fights on the night, with Jono Carroll’s long-awaited rematch with Declan Geraghty and Paddy Gallagher v Gary Corcoran, Tyrone McCullagh v Joe Ham and Johnny Coyle v Lewis Benson all competing for limelight.